The CIA sent a team to Afghanistan days after 9/11 with orders to kill Osama Bin Laden and bring back his head, a former agent has revealed. Gary Schroen flew out soon after the attacks on New York and Washington, helping to set up the 2001 invasion, he told US National Public Radio. He recalled his orders from the CIA's counter-terrorism chief. As for other leaders of Bin Laden's al-Qaeda network in Afghanistan, Mr Black reportedly said: "I want their heads up on pikes." Contacted by the radio network, Mr Black would not confirm that these were his exact words but he did not dispute Mr Schroen's account. The agent told NPR he had been stunned that, for the first time in 30 years of service, he had received orders to kill targets rather than capture them. But he says he replied: "Sir, those are the clearest orders I have ever received. "I can certainly make pikes out in the field but I don't know what I'll do about dry ice to bring the head back - but we'll manage something." Mr Schroen, 59 when the planes crashed into the World Trade Center, the Pentagon and a field in Pennsylvania, had just begun the CIA's retirement transition programme but he was asked to put it on hold two days after the attacks of 11 September 2001. As a former station chief in both Kabul and Islamabad, he was considered to be ideally placed for the Afghan mission. According to NPR, there was no doubt at CIA headquarters that the 9/11 attacks were the work of Bin Laden. Mr Schroen was given a double brief, it reported: to liaise with anti-Taleban warlords on the ground as preparation for the overthrow of the regime, and to then assassinate Bin Laden and other top al-Qaeda figures. The agency allowed Mr Schroen to pick his own six-man team and, exactly one week after 9/11, they were on a plane flying to the region, equipped with laptops, hand-held radios, instant coffee and $3m in $100 bills. Mr Schroen has released memoirs called First In, a reference to the fact that he and his team were the first US government personnel on the ground. 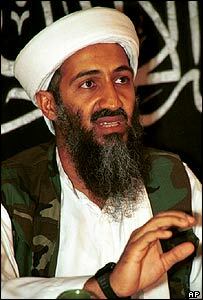 He says he is surprised that the CIA has still not managed to track down Bin Laden after nearly four years.